I remember the first (and only) time I met Bert Greene. He was much taller than I expected, and his beautiful smile and engaging personality lit up the room. The year was 1987, and I was competing at the National Beef Cook-Off in Sun Valley, Idaho. Cooking contests will sometimes have well-known chefs or cookbook authors judge their contests. Julia Child herself even judged the National Beef Cook-Off at one time. I couldn’t have been more thrilled to see Bert Greene grace the contest in Sun Valley. After the awards ceremony for the contestants, there was a press conference for those who won cash prizes. I was lucky enough to be one of them (winner of the Outdoor Category), but throughout the questions from the press, all I could think about was Bert Greene sitting there listening to us. As a longtime admirer of his cookbooks, I couldn’t believe I was in the same room with him. After the press conference was over, everyone was milling about the room. I looked over and saw several people engaged in a conversation with Bert. As they walked away and he was standing there alone, I decided to grab my one and only chance to speak with him. I mustered up all my courage and suddenly found myself in front of him, looking up at his ever-friendly face. He smiled back and said, “Hello! You did great up there!” When I finally found my voice, we had one of the greatest 10-minute conversations of my life. No one else came up to speak to him, so it was just the two of us talking about food and cooking. I was no longer nervous because we connected on a level of two people who just loved cooking and the memories they hold in our lives. In his incredible cookbook, “Kitchen Bouquets,” Bert summed up in the introduction how he feels about cooking: “Sensuality is what I love best about cooking. It is the frizzle of bacon on the back burner and the froth of scalded cream whisked into vanilla and sugar until the pans, sink, cook, and even the walls are pale, polka-spotted that make a kitchen kitchenly. Remove the mess, and for me, you dispel a measure of the magic.” Being a bit of a messy cook myself, I was thrilled to read, and feel, his words. Now, about the content of this remarkable cookbook. The first thing you notice is that it does not contain chapters called meats, poultry, salads, appetizers, or any such boring titles. No! This book has chapters called Almond, Brandy, Chocolate, Cinnamon, Coffee, Curry, Madeira, Mint, Rum, Saffron, and Yeast, just to name a few, along with tips on how a particular flavor makes the difference in a dish. One can already savor the flavors while scanning each chapter, and as hard as it is to put the book down, you need to run to the kitchen and get cooking! The recipes are beyond amazing. Just imagine the aroma of Bacon-Filled Croissants with Chive Butter permeating your kitchen, spreading homemade mustard made with a touch of rum on your next ham sandwich, or sinking your teeth into a Vanilla-Caramel Layer Cake. Or how about a Russian Veal and Cherry Stew, Lemon-Roasted Lamb, Hungarian Fennel Bread, or try one of nine delectable chocolate cake recipes. Hunt this book down now. You will thank me forever. We miss you, Bert..
Here’s one for you. I actually love the nostalgia of it. What the Cleavers probably had for dinner back in the day. Thanks, Savory Tv! I went to your link, and I actually have that cookbook! It’s one in a series, and I have quite a few of them. You’re right; it’s very nostalgic with a few scary recipes thrown in! Alas, I never met Bert however, years ago I copied his photo which sits framed in my kitchen. From this vantage point I hear him from time to time guiding me through my culinary triumphs and tragedies. 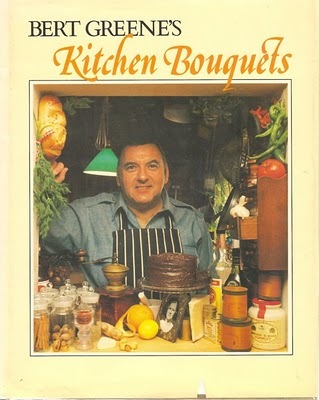 “Kitchen Bouquets” was my first and most treasured of his books. I agree, Sammie Jo. Kitchen Bouquets is my favorite, too.